Continuing with my "love" theme for February, today we have another great soundtrack story album. This time around it's Disney's "The Love Bug". Not that Lindsey Lohan remake but the all american original with Dean Jones and Buddy Hackett. 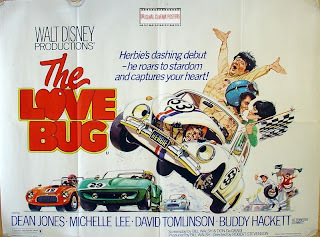 As a kid, I remember the Love Bug was always being advertised whether it was for a release of a new film, a re-release of an older one or a television showing. It seemed like the Love Bug was constantly being promoted. Remember, this was back in the late 70s/early 80s and things were much different. When a movie premiered on network television, it was a big deal. Not like today, where a film that was out 6 months ago suddenly shows up on TBS at 2 in the afternoon. Back then, cable was just coming into its own and the big networks were ABC, CBS and NBC. The movies would be shown either as a Sunday Night Movie or in the case of The Love Bug series, they would premiere on Sunday night's "The Wonderful World of Disney". This was before home video was king and if you didn't catch it when it was on, you would have to wait a long time to try to see it again. To help have the film in your head, the film companies would release the film on an LP. It was an edited version of course and it usually had a narrator to tell you what was happening since you couldn't visually see that. These story records proved to be more and more popular. I have posted many on this site before including the original Star Wars trilogy, Raiders of the Lost Ark, Tron and more. Today, I bring you Buddy Hackett narrating the story of "The Love Bug", complete with the original cast. Enjoy! Here is an episode of the A-Team featuring my friend Sala's father, Mako. Enjoy!